No set up or monthly fees. No contract terms. Open a free account, buy credits online, upload your numbers, write your message and press send. 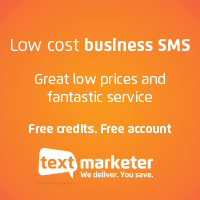 If you would like some more Text Marketer graphics, web banners or logos to promote your Text Marketer service on your website then please just get let us know and we will send you some.